We knew it was coming, we just weren’t sure when. Today my inbox was delighted to receive the official email from PSN regarding the return of the PSN store and the start of their “Welcome Back” program. In case you haven’t been paying attention, the Welcome Back program for users of Sony’s Play Station Network is an effort to appease upset after a major security breach that put personal information (including passwords and credit card info) in the hands of hackers. For the most part I have stayed away from discussion about this controversial breach of trust and how I felt as a customer. Suffice to say Sony felt the need to extend an apology to consumers and the Welcome Back program is an extension of that apology. A premium subscription service that gets you access to free games, huge discounts and great exclusives. To welcome users Home, PlayStation®Home will be offering 100 free virtual items. This is our way of saying thank you for being a loyal fan. 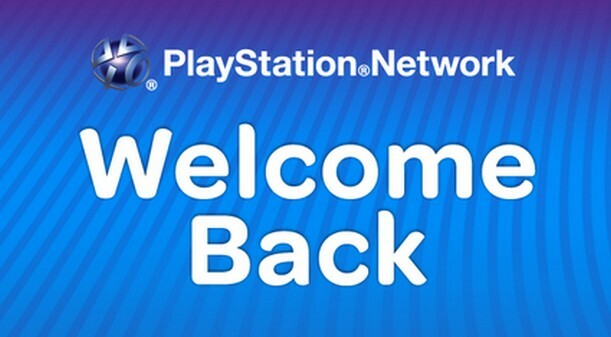 And once again, welcome back to PlayStation®Network. If you have not yet received your email I would wager that it is on it’s way. With the free access to the PlayStation Plus service, I can’t help but wonder how many will continue the service even after the trial period. Is this a case of win/win? With E3 literally around the corner I tend to think that Sony would be best to lay low after such a debacle and that instead of pushing the newest, the up and coming, that they enter into the next phase of damage control. Of course what I think should happen is rarely what actually happens and so I wait with piqued curiosity as we approach anticipated major announcements. But back to the question at hand. Sony’s Welcome Back program is providing us with some free, albeit old, content. Of the games available for you on your PS3 console, which ones did YOU download? If you took advantage of the PS+ service, PSP downloads, or PS Home items, I’d love to hear from you as well. You can download the available content on up to five activated systems that are associated with the PlayStation Network account. Posted on June 4, 2011, in PlayStation 3, Video Games and tagged Dead Nation, Free Downloads, inFamouns, Little Big Planet, psn, Sony PlayStation, Super Stardust HD, Welcome Back Program, WipeOut HD. Bookmark the permalink. Leave a comment.